Phakisha Horne is responsible for a broad range of strategic initiatives across Allsup as a consultant to Strategy & Implementation. Along with project management responsibilities, she oversees the core corporate administrative functions at Allsup, which include Internal Audit and Compliance, General Counsel, Procurement and Building Services. She reports to Dave Zura, president and chief operations officer. Horne joined Allsup in 1991 and has a broad range of experience across the company, including leadership and management positions in SSDI claims, business development and inside sales, account management and return to work services. Her previous roles have included overseeing Allsup’s commercial and consumer products and services, handling sales and account management activities, new business development, marketing and product management. 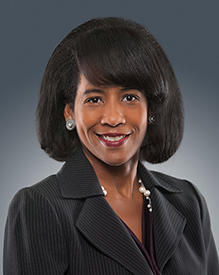 Most recently, she was senior vice president of Income Replacement at Allsup. She earned a bachelor’s degree in business administration with a concentration in general business and marketing from Austin Peay State University in Tennessee. Horne also earned a master’s degree in computers and information resource management from Webster University in Missouri. She serves on the advisory board of Sister Thea Bowman Catholic School in East St. Louis, Illinois, and she is a member of the development committee for the Mathews-Dickey Boys’ & Girls’ Club in St. Louis, Missouri.